Revis. Gen. Pl. 3(3): 101 1898. 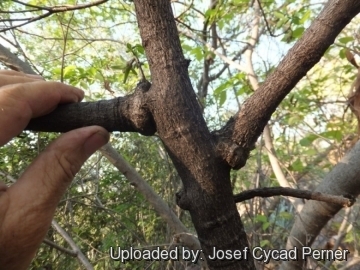 The aerial part of Jacaratia corumbensis is small in proportion to the huge root (caudex), which is shaped like a turnip, growing to a length of 60-80 cm and 15-30 in diameter. Origin and Habitat: Jacaratia corumbensis is known from South-West Brazil (Mato Grosso do Sul), South-East Bolivia, Paraguay and Northern Argentina. 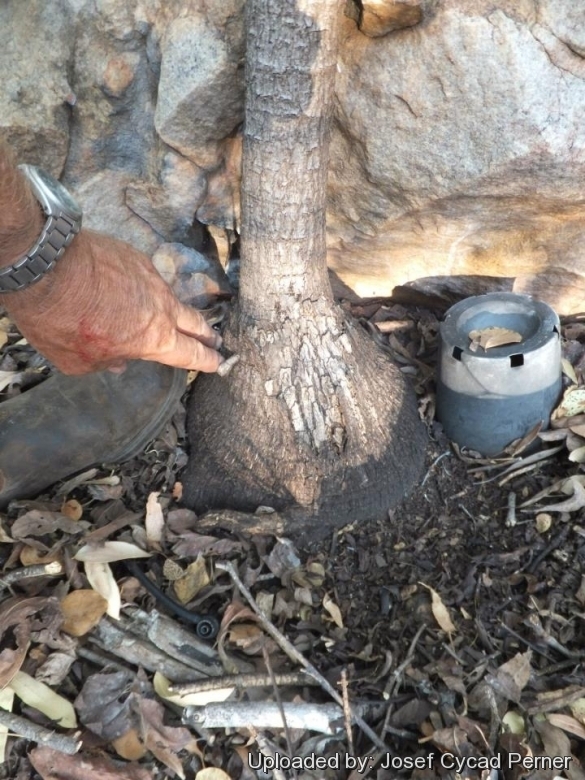 Habitat and Ecology: Populations occur on loose or sandy soils in xeric sites, both in open environments and in the understory of semi-deciduous seasonal forests and around rocky outcrops. These woodlands are characteristically seasonally wet and dry with the weather patterns of the region, with particularly pronounced and extended dry periods. The humid and rainy season is warm and followed by a hot season of drought. The huge succulent underground storage root is an efficacious adaptation to water scarcity. Seed dispersal is endozoochory (via ingestion by vertebrate animals such as mice, bats and other small mammals). Endozoochory is generally a coevolved mutualistic relationship in which a plant surrounds seeds with an edible, nutritious fruit as a good food for animals that consume it. Description: Jacaratia corumbensis is a perennial sub-frutex 0.6-3 m tall or sometime a small weak-stemmed tree up to 4.5 m tall, with a swollen tuberous caudex that stores water and that can become so large as to be disproportionate to the plants thin stalks. In tropical climes, flushes of new growth can occur at any time but are more likely during the warm wet season. Sometimes cultivated; the pachycaul shrublets form neat natural bonsais. Derivation of specific name: The epithet “corumbensis” comes from the occurrence at Corumba in the Brazilian state of Mato Grosso do Sul. Stem: The aerial part of Jacaratia corumbensis is small in proportion to the huge tuberous root, which is shaped like a turnip, growing to a length of 60-80 cm and 15-30 in diameter, with milky sap. The branches are pithy and unarmed 2-2.5 cm in diameter, with sometimes greyish to rose-coloured peeling bark and notable lenticels. 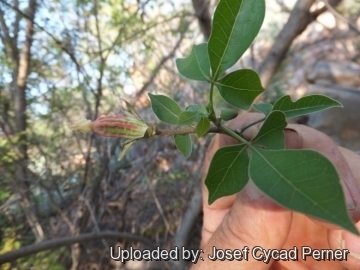 The swollen connections of the branches to the trunk seem to be a characteristic of this plant. A tuber is an underground storage organ derived from stems or roots. In Jacaratia corumbensis it can weigh up to 250 kg. It is still unknown whether this structure in is derived from the stem or from the root. In many sources the tuber of Jacaratia corumbensis is described as a xylopodium. However, the xylopodium is an extremely lignified and complex structure that does not present a special storage parenchyma. Leaves: Alternate, sessile, palmate (digitately compound) with 3-5 leaflets, or rarely simple, membranous, fresh green. Leaflets broadly ovate to lanceolate with acute tip, to 2.5-9 cm long and 2-4 cm wide, entire or lobed. Stipules absent. Inflorescences: Jacaratia corumbensis is a dioecious plants with unisexual, actinomorphic flowers in axillary or terminal clusters. Male inflorescences, pedunculate, several-flowered. 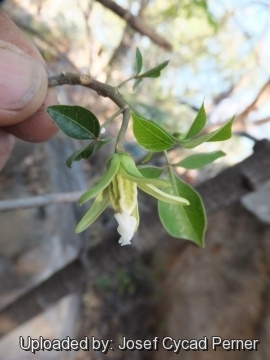 Female inflorescences 1-flowered, pedunculate. Flowers. Sepals 5, united at the base opposed to petals. Petals united forming a tubular corolla with 5 lobes. The anthers and stigmas are white and the ovary bears longitudinal red stripes. Male flowers greenish-white, corolla tube 8-10 mm long, 2 mm in diameter, glabrous outside, hairy inside, corolla lobes 4-6 mm long, 2-2.2 mm wide with 10 stamens in 2 whorls. Female flowers green with petals, 12-16 mm long 3 -3.5 mm wide. Ovary superior 5-locular. Styles very short. Fruits: Fleshy berries. 2.5-6(-10) cm long, ellipsoid-elongated, basally 5-lobate, green striped, until they ripen in yellow or pinkish-orange with red lines, 5-costate with irregular bumps corresponding with the seeds. Seeds: Numerous, approx 20 mm long and 7 mm thick, more or less smooth, whitish-yellow. Phenology: This species flowers and fruits several times a year. 3) Carvalho, F. A. & S. S. Renner. “A dated phylogeny of the papaya family (Caricaceae) reveals the crop's closest relatives and the family's biogeographic history.” Molec. Phylogenet. Evol. 65:46–53.2012. 8) Badillo, V. M. “Monografia de la familia Caricaceae”. 1971. 9) Killeen, T. J. et al. “Guia de arboles de Bolivia.” 1993. 10) Wikipedia contributors. "Seed dispersal." Wikipedia, The Free Encyclopedia. Wikipedia, The Free Encyclopedia, 25 Sep. 2015. Web. 26 Sep. 2015. Cultivation and Propagation: Jacaratia corumbensis are quite easily grown from seed although they are seldom available in nurseries. Grow in good light, don't over-water and provide a minimum winter temperature of 5-13° C as they cannot tolerate frost. Despite its adaptations to dry climates, this species will thrive in rainy climates provided it has a well drained soil provided they are frost free and don't experience cold winters. Saplings can be effectively grown in containers for many years before becoming too large and requiring to be planted into the ground. In this manner one can move them out of the cold into a warm position in a glasshouse or indoors behind a sunny window to prevent frost damage. It can be also trained as a bonsai. The enormous subterranean succulent storage root when raised makes a very nice caudex. Watering: Jacaratia corumbensis is very drought tolerant, and needs no water at all during the winter. Uses: The fruit is edible cooked, the tuberous-root raw. 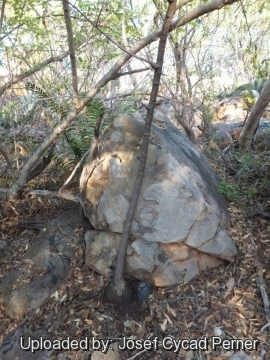 The natives used tuberous-roots (underground storage organs that can weigh up to 250 kg) as a source of drinking water after crushing or simply cutting into pieces. The tuber of Jacaratia corumbensis is also used to feed cattle during the dry season and to prepare a kind of sweet by local farmers. Reproduction: It can be reproduced both by cuttings and seeds. Plants of Jacaratia corumbensis grow reasonably quickly when they are young. It also can be started from cuttings.